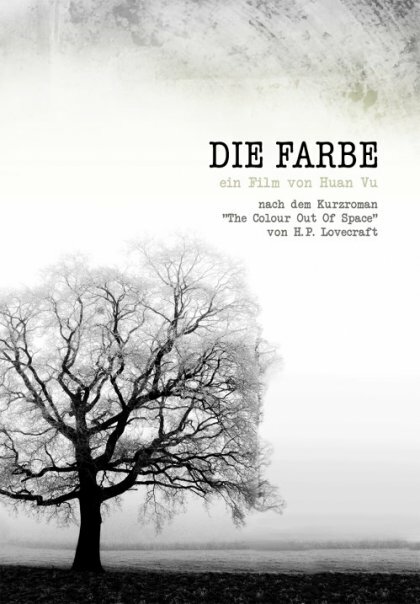 Today I watched the German Film, “Die Fabre” based on H.P. Lovecraft’s The Color Out of Space. In this version, a young American man goes to Germany to find his father who’d mysteriously run away, wondering if his panic might have something to do with his dad’s experiences during World War II. He meets an old man who remembers seeing his father as an American Medic during the war. He then tells a long tale about his neighbors that lived in the blasted valley beyond his farm house, and how they dwindled and died after a mysterious meteor fell to earth. It’s filmed in a classic stark noir, with the only color coming from the strange meteor. The acting is great as is the camera shots, but they broke a cardinal rule of movie-making which is: if you can’t nail the effects, don’t show it. The scenery is a hodgepodge of photoplasty and special effects whose execution ranks somewhere between Xena and Birdemic (they couldn’t even put real boards up over windows?) When we finally see a genuine monster, we suddenly go from “high-suspense” to mild bemusement. They could have done far more with shadows, body contortion and creative camera angles, then to try and scare us with this. Actually, one of the more frightening scenes was when we’re only shown a hand creeping along the floor coated in a dark jelly. That was far more visceral and interesting than the doctored photos and bad CG. The adaptation was a little clunky as well as we’re treated to 2 separate flashback stories that really don’t seem to mesh at all. They could have set it in World War II and have Armin tell the story to the American GI’s and spared us a lot of wasted story that didn’t seem to go anywhere. It’s a good yarn, and a must-see for Lovecraft fans. Just go get a coffee when the monsters start writhing and imagine the contorted Mrs. Gartener. It will be way more scary than what’s on screen.